The Background Hammersmatch acquired the lease to Churchgate in 2001 because they felt it was key to a redevelopment opportunity. They discussed their proposals with the Council, the freeholder, with a view to a redevelopment and by 2008 they had spent over £100,000 on design, surveys, planning and professional fees and even more on subsidising rents to ensure the shops were let on short-term leases so this would not hold up a redevelopment. When the Council invited tenders for the redevelopment of Churchgate, Hammersmatch applied. Their proposals included refurbishment rather than total redevelopment because they felt that was the most viable and least disruptive, but they were not shortlisted. In 2010 Simons was selected by NHDC as its development partner. The Refurbishment The refurbishment proposals are the same as those for which they received planning permission in 2009. That permission was renewed in 2012 and remains in force until July 2015. They propose re-cladding the shopfronts, putting in new paving and installing clear canopies over the shopfronts. There has been criticism of the way the frontage to Market Place is handled in these proposals, and we understand they agree that the proposals for latter are now outdated and might be redesigned. 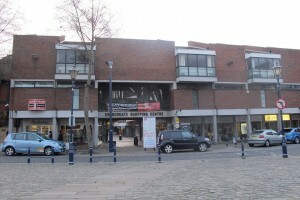 Hitchin Forum supported the refurbishment proposals when first submitted because they would substantially improve the appearance. The Extension What is new in these latest proposals is an extension over the part of the Market nearest to the shops. This would provide six additional shops/restaurants and a 5-screen cinema. They say it would be a ’boutique’ / ‘arts’ cinema. This undoubtedly will appeal to many, not least because a town of Hitchin’s size and importance commercially should have its own cinema, but also because it brings a new recreational use into the town. Because of this extension, Hammersmatch proposes moving the Market onto St Mary’s Square. What is left of the original market site is proposed to become car parking. There are two problems with this. It does not seem to take into account the needs of the market for up to 50 permanent stalls with all the building and fitting out this would entail on the raised area in front of the church. Neither does it maintain the existing levels of car parking in the area, much less increase the number of spaces as one would expect with an increase of 37% over the current Churchgate area. The suggestion is that on non-market days, St Mary’s Square would revert to parking. Viability of the Proposals Hammersmatch maintain the project would be self-funding, though we have not seen detailed figures. However, it is clear that they do not expect council or taxpayer funding for the project. They would need landlord agreement from NHDC to build the extension as this land is not currently leased to them, though they now have the necessary licenses from the Council to carry out the works entailed in the original refurbishment. NHDC would also have to give landlord consent for moving the market and creating a car park where the market is now, though the Council would retain ownership over both. However, Hammersmatch say they could submit a planning application following a full public consultation on their proposals, commence work in 2013 and it would be ready for occupation within 18 months.